Every aspect of the game: the breathtaking nautical graphics, the pewter playing pieces, the challenging nautical trivia questions, the unpredictable chance cards, and its exciting play...Nautical Trivia was created and designed for those who demand quality. Whether you are a serious sailor, sailing enthusiast or have ever dreamed about sailing, Nautical Trivia offers you all the exciting elements of actual sailing! Nautical Trivia has captured the mystique of blue water racing by simulating the sailing elements of changing winds, changing tides, tacking, racing strategy (block your opponent's wind!!!) and nautical knowledge to enjoy anytime, anywhere, at your command. A roll of the cube determines whether the driving force that propels your boat will be by knowledge or by chance. Nautical Trivia's challenging questions (many in true/false and multiple choice format) will test your knowledge of nautical history, the America's Cup, historic lighthouses, navigation, boating safety, famous shipwrecks, infamous pirates and world geography. 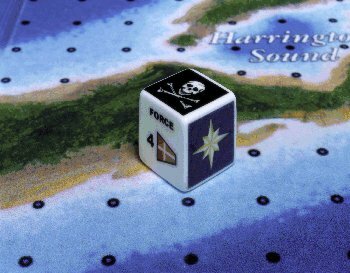 The "Jolly Roger" and "Treasure Chest" chance cards are designed to impact the outcome of the race with unpredictable variables based on actual sailing situations. Just when you thought it was smooth sailing, a "Jolly Roger" hurricane card blows all boats off course out to open sea!!! Nautical Trivia is played with one player (captain) for each sailboat or groups may divide into crews for each boat and choose a captain. Two, three or four sailboats may compete in a race. 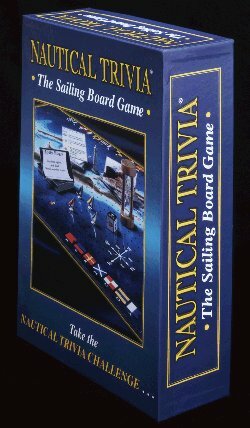 Nautical Trivia is designed to challenge sailors of all ages and anyone with a desire to experience the sport of sailing. The Perfect Gift for the Sailor!! !